It took John Hiatt a long time to find his place in the music world. He headed to Nashville in 1970 and was discovered by an Epic Records talent scout, eventually recording two critically acclaimed records—1974’s Hangin’ Around the Observatory and 1975’s Overcoats—that garnered few record sales. Then label-less, he did a few years of solo touring before signing to MCA, releasing two more records: 1979’s Slug Line and 1980’s Two Bit Monsters. At this point, he hadn’t even settled on a sound. These two records were vaguely New Wave-ish. 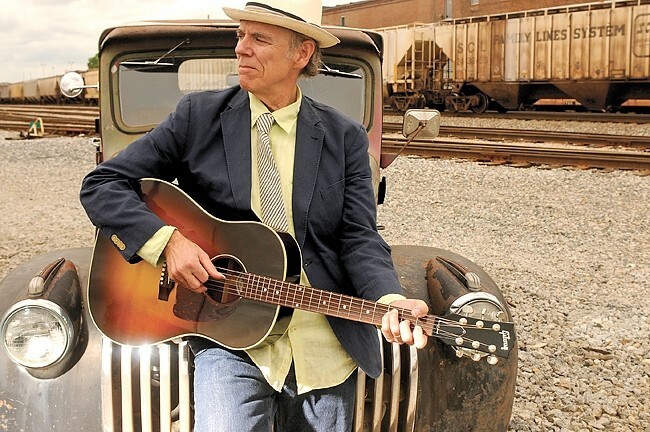 THE SONGWRITER: John Hiatt plays a solo acoustic concert on March 11 at the Fremont Theater, brought to you by Otter Productions Inc. He then hooked up with Ry Cooder, where he sang a couple of songs on the soundtrack to the 1982 Jack Nicholson film The Border. His unfortunate pattern of great reviews and poor sales continued after he signed with Geffen Records, releasing 1982’s All of a Sudden. He also struggled with alcoholism and the suicide of his first wife, and Geffen dumped him. Things could have gone either way at this point. He could have continued to circle the drain until his life was flushed away, but instead he got sober, remarried, signed to A&M Records, enlisted Cooder and bassist Nick Lowe and session drummer extraordinaire Jim Keltner and recorded 1987’s Bring the Family, a rootsy mix of rock, blues, and folk. It was his eighth album and the first to reach the charts. Since that rough beginning, he’s released a total of 22 records, most recently 2014’s Terms of My Surrender. While his record sales have never been brisk, Hiatt’s always had a loyal fan base, and his songs have been recorded by everyone from Rick Nelson and Dave Edmunds to the Searchers, Three Dog Night, Iggy Pop, Bob Dylan, and Bonnie Raitt. This weekend’s concert marks Hiatt’s first return to the Central Coast in decades. “John Hiatt first graced the Fremont Theater on March 30, 1994, in a show presented by local radio station K-OTTER 94.9 FM,” concert promoter and former K-Otter owner Bruce Howard wrote in press materials, “and he returns 22 years later, on Friday, March 11, supporting his newest release Terms of my Surrender,” (doors at 6 p.m.; show at 8 p.m.; all ages; tickets are $40 plus fees at all Vallitix locations including Boo Boo Records or at vallitix.com). Expect Hiatt to perform a mix of his classics such as “Crossing Muddy Waters,” “Thing Called Love,” and “Have A Little Faith In Me,” as well as newer work. Couples Mark Davis and Karoline Hausted, and Bob and Wendy Liepman are each in their own right fantastic musicians, and Mark, Karoline, and Wendy are each amazing songwriters. They all would have had perfectly fine careers if they had never met, but they did meet, found kindred spirits, created musical synergy, and become Shadowlands. OUT OF THE SHADOWS : Ethereal pop folk quartet Shadowlands plays Steynberg Gallery on March 12. Their first self-titled album won Second Place in the NTMA Album of the Year competition in 2015. They were invited to play the main stage at last year’s Live Oak Music Festival. Their songs can frequently be heard on public radio station KCBX 90.1 FM. Now the ethereal folk pop quartet is returning to Steynberg Gallery for an intimate concert on Saturday, March 12 (7:30 p.m.; all ages; $15 tickets by calling 547-0278). I hope this means a new album is in the works! Don’t miss this stunning supergroup! Igudesman & Joo don’t just play music, they create a visual and sonic spectacle! This Tuesday, March 15, the duo plays the Christopher Cohan Center of the SLO-PAC, performing their hit show And Now Mozart (7:30 p.m.; all ages; $30 to $45 at 756-4849 or calpolyarts.org). NASHVILLE! : Matt Bednarsky headlines the March 10 Songwriters at Play showcase at the Shell Café. The Cayucos Sea Glass Festival, which takes place this Saturday, March 12 (10 a.m. to 5 p.m.), and Sunday, March 13 (10 a.m. to 4 p.m.), near the Cayucos Vets Hall by the pier, will have entertainment, too. 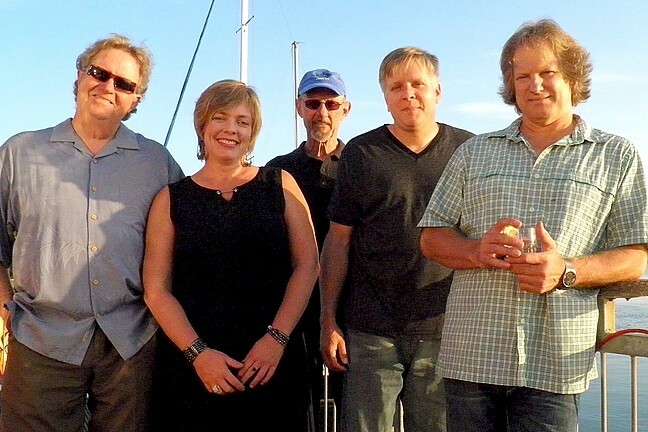 On Saturday, Back Bay Betty brings their originals, classics, and funky blues from 1:30 to 5 p.m. (all ages; $5 entry fee). FUNKY BLUES GLASS: Back Bay Betty brings their originals, classics, and funky blues to the Cayucos Sea Glass Festival on March 12 near the Vets Hall. Cuesta Spring Choir Concert featuring the Cuesta Chamber Singers, Voce, Encore, and the Concert Choir perform on Sunday, March 13, in the Cuesta Cultural and Performing Arts Center (3 p.m.; all ages; $10 students; $15 general admission; available at cpactickets.cuesta.edu or by calling 546-3198). Hear everything from jazz, gospel, and classical to folk, Latin, blues, and rock. Voce is covering songs by George Benson, Michael Jackson, Stevie Wonder, Keb’ Mo’, and the Steve Miller Band. The SLO County Jazz Federation presents a showcase of this year’s winners of their Young Jazz Scholarship Program on Sunday, March 13, in the Steynberg Gallery (4 p.m.; all ages; free). “This program, started in 1983, awards scholarships to talented and deserving students from local schools in an effort to further their musical development and to keep the jazz tradition alive,” according to the Jazz Fed. “This year’s recipients are Breanna Chambers (trumpet) and Ben Rosenberg (saxophone) from SLO High; Addison Rifkind (guitar) and Michael Woodson (trumpet) from Cal Poly; and Matthew Evans (bass) from Cuesta College. They’ll be backed by a rhythm section of Darrell Voss (drums), Gary Drysdale (guitar), and Ken Hustad (bass). The Matt Taylor Memorial Trust sponsors the concert. Call 546-3733 for more info. It’s time for another SLO Record Swap this Saturday, March 12, from 1 to 5 p.m. in the SLO Grange Hall ($1 entry free; kids 12 and under are free). I attended the last one in November, and it’s a real gathering for music lovers. They had more than 500 attendees and 17 vendors, and I snagged a few sweet albums. If you’re a record collector, there’s a lot to see and buy. If you want to become one, there are also record players for sale and plenty of knowledgeable folks to help your foray into an incredibly rewarding hobby. Nothing sounds like vinyl! START ’EM YOUNG! 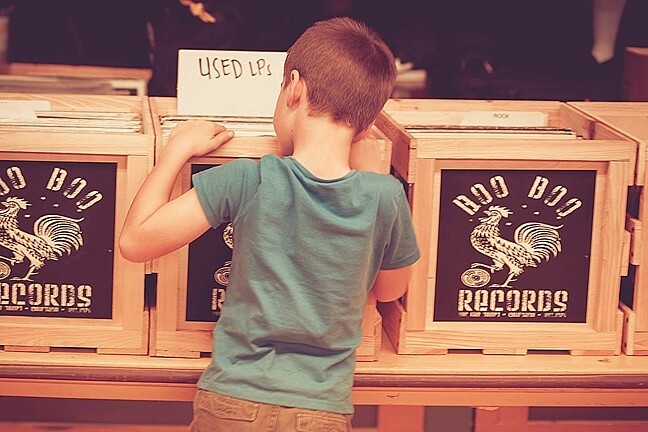 : A kid digs through the stacks at last November’s SLO Record Swap, which returns to the SLO Grange Hall on March 12. If the forecast holds and the weather’s clear this Saturday, expect the beer garden to be up and running with brews from Libertine Brewing Co. and Central Coast Brewing, as well as food trucks! Kudos to Boo Boo Records, the event’s main sponsor, and SLO Record Swap for keeping the vinyl dream alive!